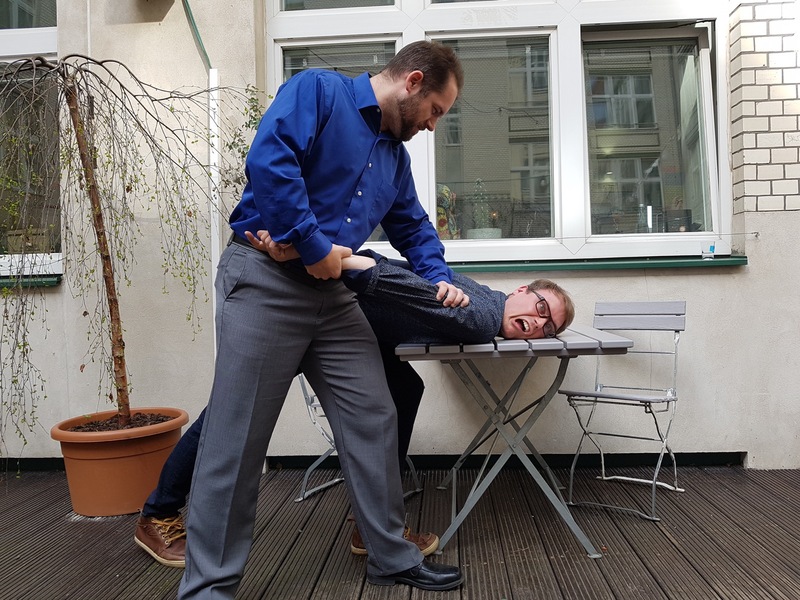 At agile42 we are always interested in trying out new approaches. We have applied Nonviolent Communication (NVC) for a while now but feel that it doesn't necessarily give the desired results fast enough. In our search for instant gratification, we instead created the Full-Violence Communication (FVC) approach. Unlike the many ancient Japanese methods available for finding out the next steps, including genchi genbutsu and heijunka, FVC is a quite recent technique from the US. It follows the basic agile tenet of just doing it and asking for forgiveness later. As you will see, FVC embraces diversity and dissent and lets people bring alternative facts to the table. 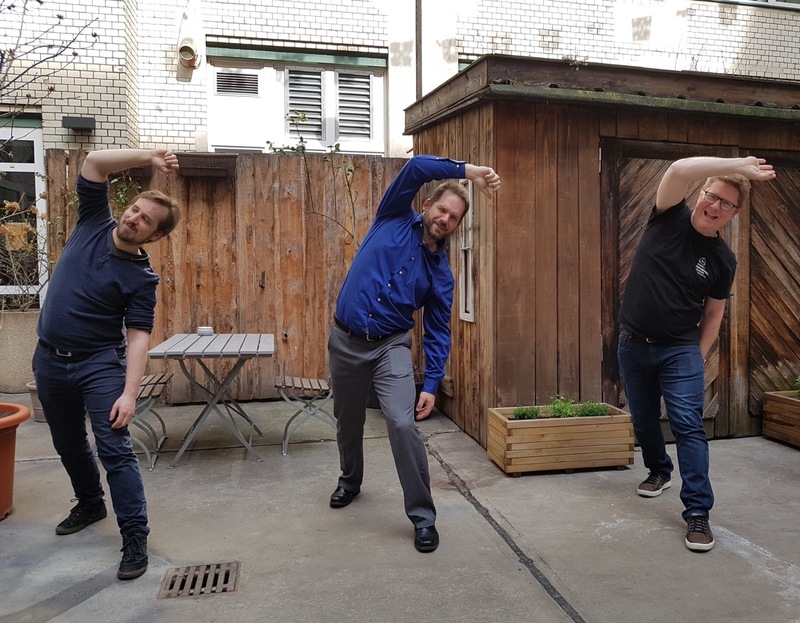 agile42 coaches Simon Sablowski, Daniel Lynn and Bent Myllerup warming up before the FVC session. The FVC method is fairly simple, bordering on obvious. Complicated processes require people to spend a lot of time on figuring out what actually needs to be done at any given point in time. Since FVC relies on primal reactions in the human brain, it totally bypasses the frontal cortex that is responsible for rational thought processes. This way the higher cognitive functions are freed up for tackling technical complexity in e.g. the software product the team is working on. As you can see, the argument is settled by the simple expedient of seeing who is the last person standing. This lets the team rapidly and efficiently converge on the solution with the strongest backing. As a side effect, the team quickly becomes extremely motivated and gains an immense amount of focus. This obviously saves a lot of time and reduces the cost of delay. We do not know of any other method that achieves this kind of results in such a short time. Martin von Weissenberg agrees that Daniel Lynn is right about story points. Scrum sensei Daniel Lynn is one of the inventors of FVC and a strong proponent of the method. Asked to summarize the method in one sense, he thinks for a while and says: "Might makes right. In other words, if all we have is opinions, let's go with mine." Gaetano Mazzanti notes that the agile42 coaches were not convinced at first, but that Daniel Lynn was very persuasive. "Having discussed the topic with Daniel, I now see that FVC is a fantastic tool in my toolbox. This could speed up the coaching process immensely." Daniel Lynn explains the finer details of daily standups to the not very stand-uppish team. Simon Sablowski and Martin von Weissenberg agree. "Awareness brings choice. Thus if somebody makes a choice, and applies FVC, then the others will quickly become aware of it. Unless of course they are unconscious," contemplates Martin. 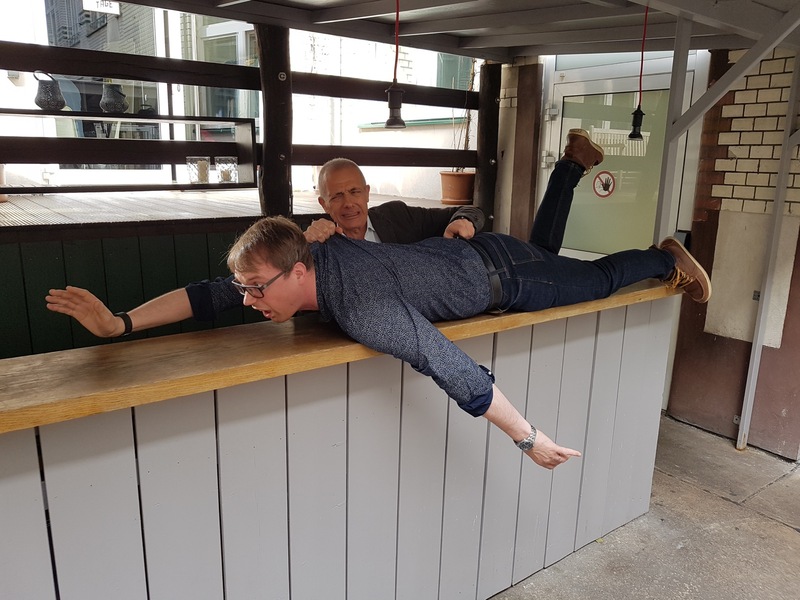 Gaetano Mazzanti (AKT) proves to Martin von Weissenberg (CEC) that Kanban is better than Scrum. For teams who want to practice FVC on their own, we can recommend the good old Finnish party game where you bring lots of vodka and one puukko knife each to a dark hut in the woods. This game obviously works best in a multi-team setting but can also work well within a single team. The vodka serves double-duty as internal cushioning for falls and internal disinfection of possible wounds. Naturally, the game can also be played alone, but that requires a lot more vodka. 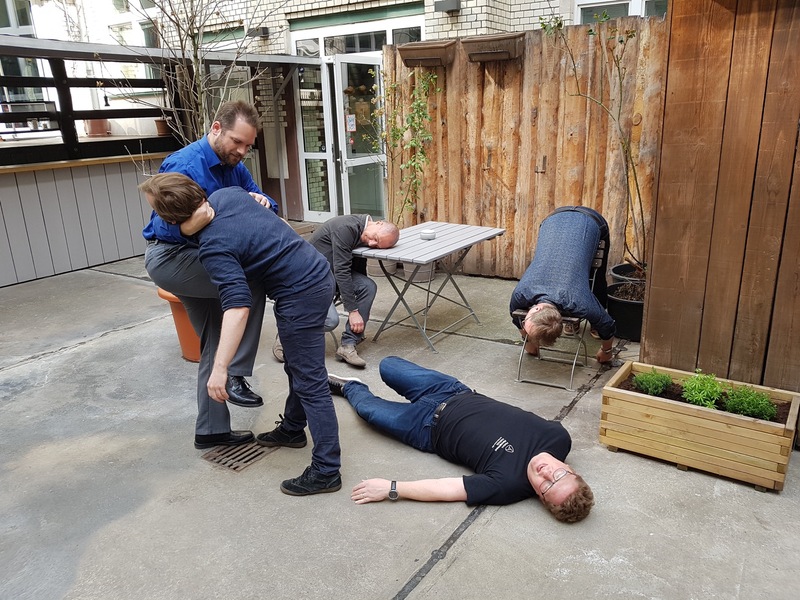 Coming soon from agile42: Full-Violence Communication classes. Stay tuned!